This interactive experience will test your group's wits. You'll be locked in a room for 60 minutes; to escape, you'll have to find clues, solve puzzles, and crack codes. This escape game is sure to test your team members' communication, collaboration,and brain power. Pros: You'll get to show off your super sleuthing skills. All of that Matlock has finally paid off. Cons: Well, this is obvious - you're locked in a room with your coworkers for an hour. Team bonding, indeed. Details: A maximum of eight people can play at the same time and the cost is $25 per person. To book a private event during the week, contact Bull City Escape directly. In search of a new favorite escape game spot? Hoodline crunched the numbers to find the top escape game spots around Durham, using both Yelp data and our own secret sauce to produce a ranked list of the best spots to venture next time you're in the market for escape games. 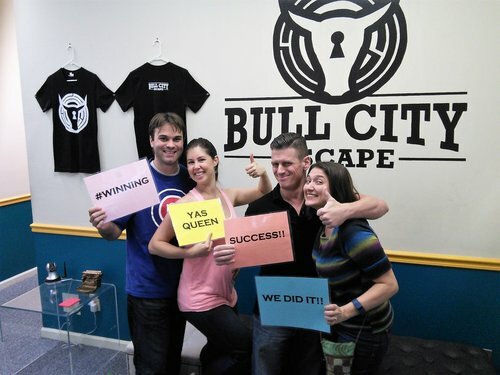 Topping the list is Bull City Escape. Located at 711 Iredell St., the escape game spot is the highest rated escape game spot in Durham, boasting five stars out of 59 reviews on Yelp. 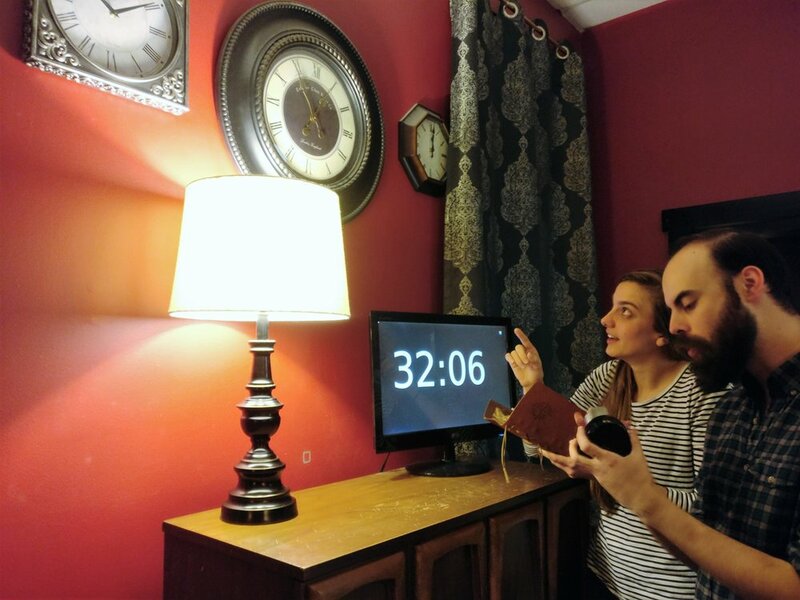 Does your family love tackling escape rooms together? Do your friends plan their vacation itineraries around escape games? Here are some fun gift ideas for your Sherlock-obsessed, puzzle-addicted, room-escaping loved ones! NOTE: Bull City Escape is not receiving any compensation for this post. These are just games that we enjoyed and want to recommend to others. 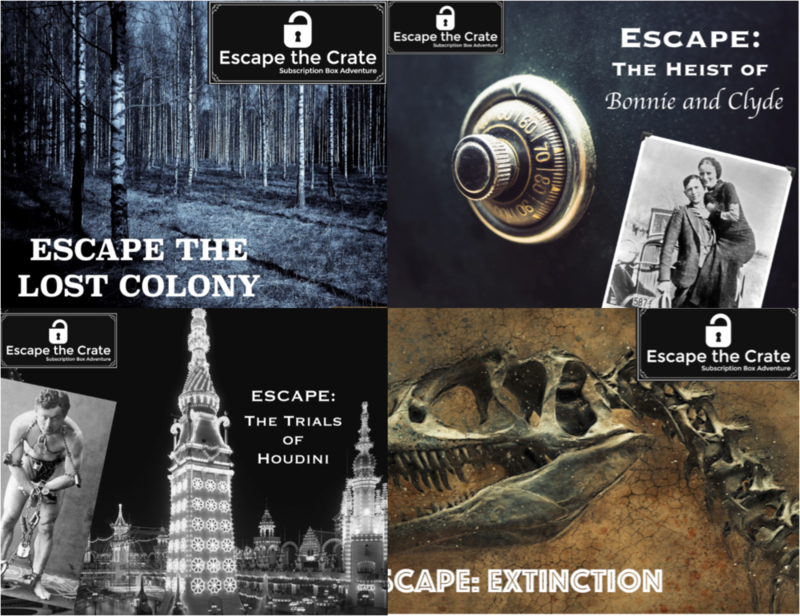 Escape the Crate is a series of "escape room in a box" games. The materials have a homemade quality to them, but the puzzles are clever and entertaining. The series follows a villain through time to stop him from altering history. Each game (or chapter) focuses on a different time period and does a great job of integrating historical facts. Perfect for puzzle-loving history buffs! $29.99 + shipping. Games can be purchased individually or through a subscription. Unlock! is a card-based game series. Games involve a combination of cardplay and entering information into an app. You won't destroy any of the materials during gameplay, so you can easily repackage it and give it to someone else (er, not that we're condoning regifting...). Affordable and compact, these games would make great stocking stuffers as well. We enjoyed Squeek & Sausage, The Formula, and The Island of Doctor Goorse. There are 3 newly released adventures (The House on the Hill, The Nautilus' Traps, The Tonipal`s Treasure) that we haven't played yet, but are on our Christmas list! $15 per game. There are 6 different games available. Each Exit: The Game contains a journal, decoder wheel, "strange" items, and 3 stacks of cards. This game does not require a separate app or website - everything you need is provided in the game box itself. Gameplay involves manipulating and partially destroying game pieces, which is fun but also means you can't easily repackage the game for multiple uses. We were impressed with the puzzle design, artwork, hint delivery system and method of progression. Of the three games we played, we recommend The Abandoned Cabin and The Pharaoh’s Tomb. We did not enjoy The Secret Lab and do not recommend it. $13-16. There are 6 different games available. Journal 29 is a "unique book game where you can solve riddles and puzzles and submit your answers online to get the keys and move forward" which is an accurate (if staid) description. We were surprised at how much we enjoyed this book. It's full of strong, clever puzzles that make innovative use of the book format. Some of the puzzles require searching for answers on the internet, which opens up every imaginable possibility, so it really pushes you to think creatively. The biggest downside is the lack of a formal hint system. $16. There are 60+ puzzles packed in this book. While they do connect to each other, the book does not need to be completed in one sitting. We played Dr. Gravely's Retreat which is more story-driven than the games above. The story was well-written, intriguing ... but waaaay too wordy. Still, the artwork was beautiful and it included some clever physical puzzles. It was fairly simple to reset and did not involve destroying any of the game pieces. The box says its for 3-8 people, but we recommend it for 2-4 players. $22. There are 2 different games available (Secret of Dr Gravely's Retreat and Mystery at the Stargazer's Manor). Confession: we have not actually played this game yet BUT WE REALLY WANT IT (::hint:hint::). This game launched on Kickstarter in 2016 ... and immediately sold out. It was then picked up for production by Mattel ... and immediately sold out again. Fingers crossed that a new batch will arrive in time for the holidays. You can gift a real-life escape room experience, of course! The escape room industry has hit the US full-force and there is likely to be one near your loved one's hometown. See if you can purchase a gift certificate or (even better) plan the excursion. Create a fun, unique, and memorable experience with your family and friends! Bull City Escape is featured in Triangle Home TV's Food & Fun episode. Tom, Emily and Bree recently took a one-tank trip to Durham to take on Bull City Escape. If you love puzzles, this is for you! Gather some friends, co-workers or complete strangers who look really smart, and tackle this real-life escape game. You will be locked in a room together. You have to hunt for clues, solve puzzles and use teamwork to find the key that will lead you to freedom. You only have 60 minutes and will be allowed three hints. We found this game is great for tweens to adults. If you are interested in booking a game, visit Bull City Escape’s website for more information. Imagine yourself locked in a room of clues and codes with friends, family members, co-workers or even strangers. You are given an hour to solve puzzles, crack codes and locate the key that leads to your escape. Sound thrilling? The experience is real at Bull City Escape. A popular city attraction around the world, Durham now has its own interactive escape game thanks to Bull City Escape owner Alice Cheung. Motivated by her love for trivia, mysteries and game shows, Alice began to explore escape games around the United States and returned to Durham with ideas of her own. She relied heavily on the community of people who take pride in local businesses when creating her own. In addition to the encouragement of Durhamites, she credits her support to a small business seminar at Durham Technical Community College and the guidance she received from the Women’s Business Center. 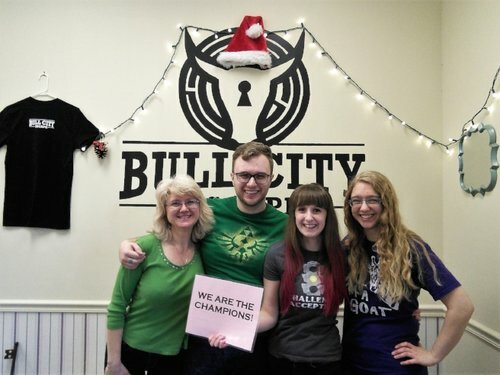 Alice designed Bull City Escape with the player in mind, providing them with a fun challenge and contributing to the development of problem-solving skills, leadership and teamwork. Bull City Escape, which hosts its grand opening Friday, June 5, is located at 711 Iredell St. Games are $25 per person, but a 20% off promotion code (GRAND_OPENING) can be applied when booking online for the first full month.